So we are back in the laundry room today and talking about organization. After installing our new shelving we had a ton of space for storage and we are still trying to work it all out. Before now our laundry was all over the place, in different rooms, piled in closets - we were having issues. So when installing our shelves we knew we wanted to create a designated laundry sorting station that would be organized, easy to get to and out of the way. So we decided to use the space underneath our shelving for our laundry sorting. Only thing is, we had some beat up laundry baskets - that were overflowing (especially since we now have four people living here). This wasn't working for me.. So we went on a search for new laundry bins and this is what we ended up deciding on: Crate & Barrel's Folding Bins - and we love them. 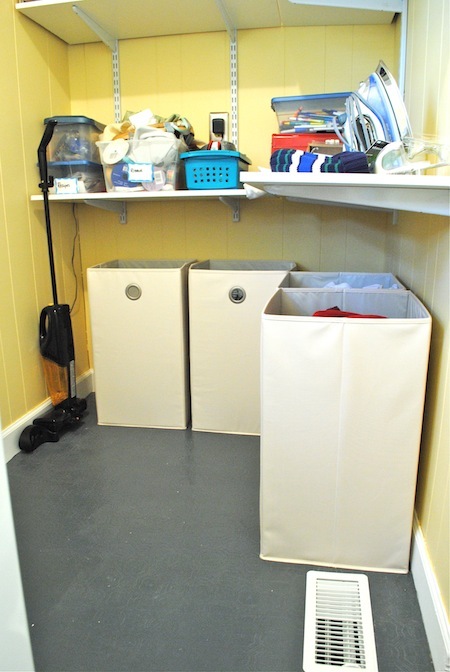 For one, it looks so much better and two, they are large enough to handle all of the laundry coming through this space now. Now, these things were not cheap. We searched so many different stores - even the discount ones and we couldn't find something that we liked at a lower price, this style bin was even more expensive at one discount store. We decided that our current laundry system was driving us absolutely nuts and investing in something we liked was worth it - and it definitely has been. This space is also an open space in our house and the main way to exit to the backyard so having our laundry hanging out all over the place was a little awkward. At least with these bins everything is tucked away and hidden much better. 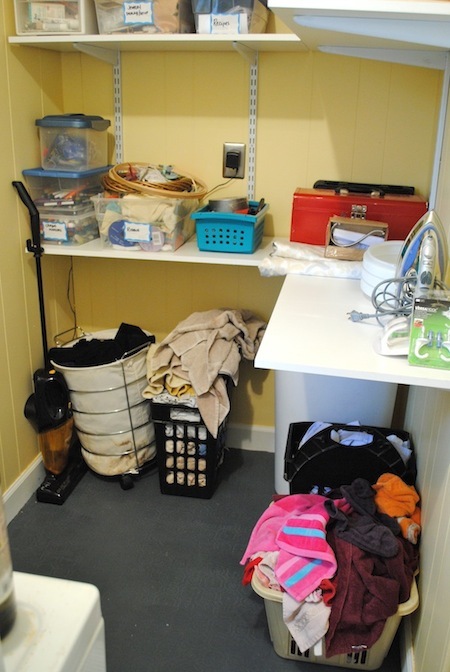 Laundry is no longer piled up, scattered and taking up valuable space in our little home. So now I'm on to deciding on something for the actual shelves. 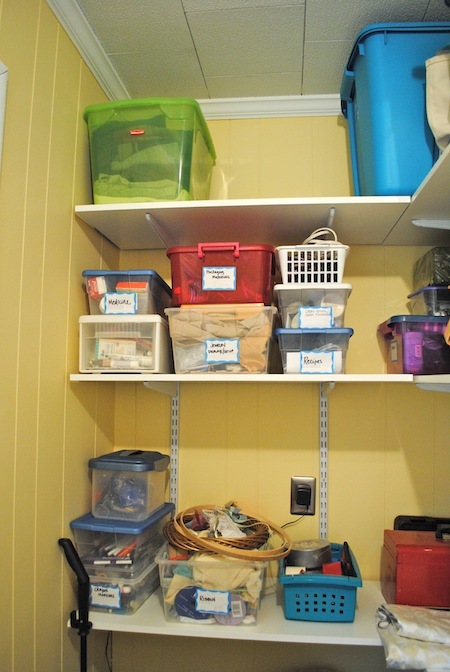 Everything is organized and labeled but the mismatched bins are driving me crazy. For now it's all good but I'm definitely on the look out for something a little more streamlined and pleasing to the eye for this open storage. So stay tuned, I'll be sharing what we do soon! Hope everyone had a fantastic weekend! Don't forget to go and enter the giveaway at Sew Gloried! 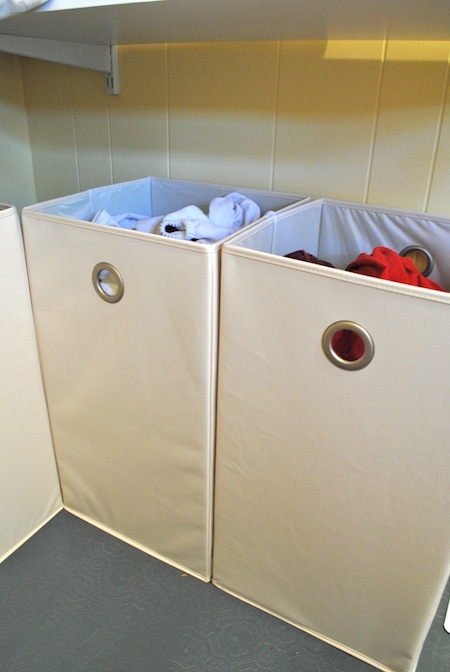 Love the laundry baskets! I've been searching for some cute baskets to put our laundry in as well! That's one thing I said we're definitely doing in the new house - several laundry baskets! Maybe that'll reduce the mountain sized pile ups... Yours are really cute..
Hi, Following you from the blog hop! Your laundry looks so organized now. I am in the middle of reorganizing my pantry as well :) Hope you stop by sometime.